Daniel Fortune was sentenced to life in prison for the 2008 attack, which left a 10-year-old girl and her father severely injured. Serving life in prison for a 2008 machete attack in Pittston that nearly killed a 10-year-old girl and her father, Daniel Fortune apparently has exhausted his chances for an appeal in the case. The Maine Supreme Judicial Court published a decision Tuesday denying his latest petition. The court heard oral arguments in the most recent challenge two months ago. Attorney Rory A. McNamara, arguing on Fortune’s behalf, had asked the Maine Supreme Judicial Court to order clarification of an April 2016 order from a superior court judge regarding ineffective assistance of one of Fortune’s prior appeal attorneys. The issue was Fortune’s right to confront witnesses against him and in particular, his co-defendant and foster brother Leo Hylton. The state’s highest court declined to send it back to the superior court judge. Gorman had asked a number of questions at the oral argument session in Portland. District Attorney Maeghan Maloney had argued on behalf of the state in asking that Fortune’s request be denied. McNamara, also via email Tuesday, said, “I do not have a comment at this time.” Fortune, now 29, formerly of Augusta and Gardiner, and his foster brother Leo R. Hylton, now 25, were convicted of invading the home of William Guerrette, a former state legislator, and his family and attacking them, leaving the father and the daughter fighting for their lives and sending the mother fleeing to a neighbor’s for help. On Tuesday, William Guerrette said he only thinks about Fortune now when the case comes up in the news media or sometimes when he looks at his daughter. “I just hope he regrets what happened to my daughter when he goes to sleep at night,” Guerrette said. “I wish he’d man up. That’s the only part that really bothers me. He’s just looking for a way out of responsibility for his actions.” Nicole, now 19, who suffered brain injuries in the attack, “is making good progress,” Guerrette said. Fortune, who had been a star athlete at Gardiner Area High School, had been a friend of the Guerrette family and occasionally spent the night at their home, at one point stealing a safe from the home that contained thousands of dollars in cash and valuable coins. Hylton pleaded guilty to a number of charges related to the May 27, 2008, attack on the family and was sentenced to 50 years in prison. In a re-enactment recorded on video, Hylton led investigators through the Guerrette home to show how he swung a machete at Guerrette’s neck after the man pointed a handgun at him, and then described how he ascended a stairway to begin attacking Nicole to eliminate witnesses. Fortune was convicted in May 2010 by a jury in Somerset County. 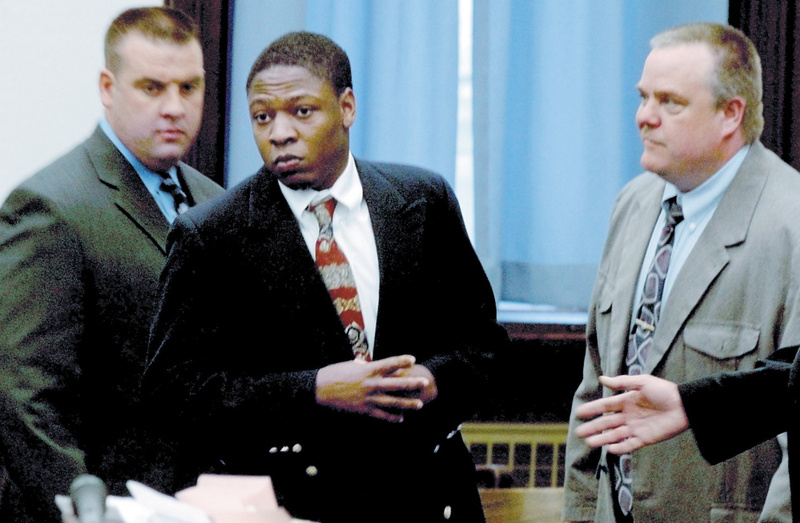 Fortune, who testified he hurt no one, received concurrent life sentences on three aggravated attempted murder convictions and shorter prison terms on a series of burglary, robbery and conspiracy charges. In December 2011, the Maine Supreme Judicial Court issued a unanimous ruling upholding Fortune’s conviction and the concurrent life sentences. In that appeal, Fortune maintained the life sentences were excessive and disproportionate to the crimes. Fortune’s case was the first time the state’s harshest penalty — life in prison — was imposed for a crime that its victims survived. Judges must abide by strict guidelines set by the state supreme court to impose a life sentence.